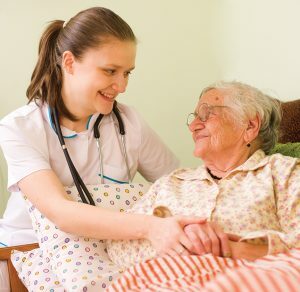 Home health is a physician-ordered plan of care available to patients after a hospital stay, the onset of a new diagnosis, or in the event an existing illness becomes worse. It is a way you can recover in the comfort of your own home with the support of your family and friends. And, it can be just as effective as care received in a hospital or skilled nursing facility. Homeland HomeHealth patients are cared for by a multi-disciplinary team of professionals including nurses, CNAs, and social workers, as well as physical, occupational, and speech therapists. Each patient’s care plan is individualized based on their particular condition. Homeland HomeHealth’s medical professionals provide knowledge and expertise in wound care, cardiac care, palliative care, fall prevention, rehabilitation services, intravenous therapy, and more. Costs for home health services are typically covered by insurance, and Homeland staff are happy to assist you in meeting referral requirements. Homeland HomeHealth is certified by Medicare with deemed status and accredited by Community Health Accreditation Partner (CHAP). Contact us to learn more and discuss your options.